Garret Elder, 10, positions himself between the ball and other players during a game of broom hockey Tuesday at Frontier Ice Arena in Coeur d’Alene. Instead of playing a golf video game, kids are learning the sport on a golf course. Instead of playing tennis on the Wii in a dark living room, kids are running across an open court in the sunshine. Instead of an app, device, or screen showing them how to do something, kids are doing it for themselves. Get outside. Learn something new. Enjoy being a kid and being around other kids. This is the formula for the second Unplug and Be Outside program, taking place in Kootenai County today through Saturday. 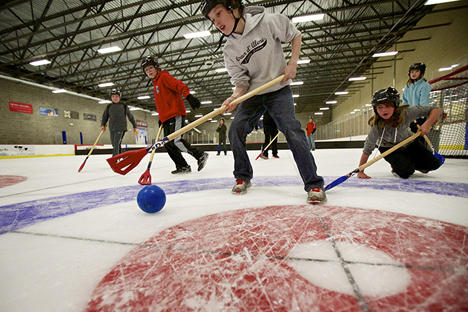 Children and their families can choose from almost 60 free activities – including Yoga, broomball, Zumba, ice-skating and fly tying classes – during what is spring break for many students. “We all work together to offer these free activities for one week to our community,” said Josh Oakes, Recreation Coordinator of the Post Falls Parks and Recreation Department. Blue Cross of Idaho sponsors the statewide program, which relies on local organizations to provide many of the resources that fuel program activities. In North Idaho, the program is collaborating with more than a dozen organizations, such as the Boys and Girls Club of Kootenai County, Peak Health and Wellness Center, the Kroc Center and the Frontier Ice Arena. The program aims to “empower all Idahoans to lead healthy lives by developing a sense of place in the Idaho outdoors.” Oakes, who discovered the Unplug and Be Outside program at a recreational conference in West Yellowstone, sees the impact technology is making on children, citing that children are spending an average of 30 hours per week watching television or playing a video game. Growing up in southeastern Idaho, Josh Oakes experienced that sense of place for himself. He wants other families to find that place, too. “There’s a lot of people in our community that do not have the means to do all of these activities. Many can’t just sign up for martial arts or broomball. Many don’t even know these services are available. So people can experience those things for free,” Oakes said. And if that person ends up loving martial arts, that’s an open door for them, Oakes said. Last Saturday, the first day of the Unplug and Be Outside program in North Idaho this year, was a launch pad for this week’s events. Aiden Meyers, 9, of Coeur d’Alene, helped teach the “Archery Instruction with CDA Bowmen” with his father and sister. More than 70 people showed up to the free event. “He’s doing really good,” said Aiden’s dad, Mark Myers. “He’s probably going to trophy this year in his winter league. His sister is a deadeye, too. Shortly after the kids were leaving, Aiden put up a balloon to shoot but before he could shoot it, his sister shot the balloon from clear across the room,” Meyers said. Mark’s marksmen were among six other “range masters” who aided in teaching participants archery skills. Of all the benefits the program offers to others, Oakes can pinpoint the program’s greatest reward to him. For a complete schedule of this week’s Unplug and Be Outside events, visit www.UnplugAndBeOutside.com.